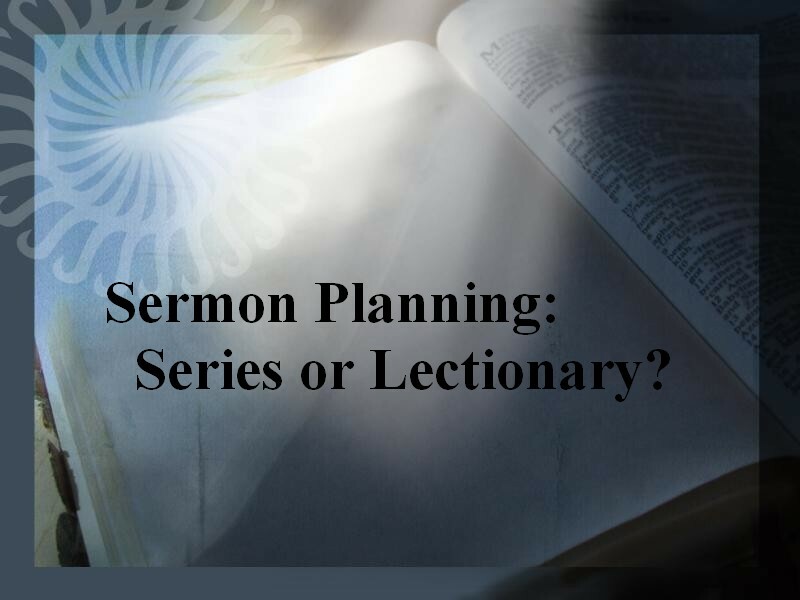 Sermon Planning – Series or Lectionary? Yesterday I returned from my first ever sermon planning retreat. For several years now I have been planning my sermons on the run, fitting a few solid half-days into my regular work week at the church study, hoping and praying that no emergencies or minor distractions would come knocking. It has worked, but I always longed for more – more time, more prayer, more study, and more focus. In the midst of this worshipful work, I would always say to myself that one day I would bite the bullet and designate time away so that my planning and prayerful reflection could be done with better intentionality. Thanks to my better half and her persistence in making me follow through on such things, I finally acted on that desire. I am aware that there are many preachers who, for varied reasons, don’t plan sermons far in advance. I used to be one of them. For the first twelve years of my ministry or more, I was a lectionary-only preacher, and thanked God regularly for the ecumenical efforts of the CCT and the resultant gift of their collaborate work: the Revised Common Lectionary. I would describe the lectionary in ways similar to how Eugene Peterson describes the Book of Psalms. If the biblical psalter is the bible’s original “Book of Common Prayer” or “School of Prayer,” then the lectionary “schools” both preachers and congregations in the rhythm of Jesus’ life, marked beautifully by the annual cycle of the church year that begins each Advent and concludes each Christ the King Sunday. Let me take a moment to testify – twelve years of that annual dance did more than shape my calendar, it placed Jesus’ birth, baptism, life, death, resurrection, and subsequent work of his Spirit-gifted disciples deep in my bones. I would shout-down any lectionary nay-sayers who claim that the windy, blow-where-e’er-it-will-Holy-Spirit cannot work well through committees or ecumenical text teams that meet years prior to the preaching event and the local context of a present day congregation’s worship. I experienced quite the contrary. I was repeatedly amazed at how that same Spirit could amaze and surprise me, working through scholars and liturgy teams years before, outlining a series of Sunday texts that would come to me and my congregation at precisely the right time, comforting after a collective tragedy here – going straight for a spiritual tumor there, which the soul-piercing accuracy of a surgeon’s knife. I say all of that to emphasize I am not an anti-lectionary preacher and never will be. At the same time, I have discovered the lectionary, like any preaching plan, has both its strengths and weaknesses. One of its great strengths was to push me into stories and pericopes that I might be less inclined to choose for myself- forcing me to struggle with difficult passages, hard-sayings, and confusing texts. That very strength, after I had experienced its three-year cycle four consecutive times, became its weakness. What about the portions of Scripture that are not covered? Can the church mark the Lenten or Advent seasons with a different set of scripture lessons and themes while retaining penitential disciplines and practices? What of those high holy days that have the same passages for each year? Can’t they be varied? I have discovered that for me, the answer is yes. I have also discovered that advance sermon planning is essential, whether one is a lectionary preacher, a series preacher, or someone in-between (which is where I find myself these days). I am now at a point where I try to plan at least one year in advance. The benefits are enormous. Planning ahead allows everyone in the congregation to better participate, invite unchurched friends, and find creative ways to bring the many congregational gifts already present in our church into our worship planning. In some cases, I have found it helpful to develop a series theme that hopefully emerges from the lectionary texts already planned, as Bill Barnes suggests here. Other times, I have departed from the lectionary altogether for series preaching, especially when the RCL moves away from closely related scripture lessons (Advent through Trinity Sunday) to a lectio continua pattern that begins after Trinity Sunday of each year. In my next post, I hope to give some details about how I structured my first sermon planning retreat, what I learned and accomplished, and why I have already planned my next one. For ten years, I was grateful for the RCL as I planned music for worship. Now, as of August, I’m in the pulpit instead of behind the music stand, and my experience echoes your beginning journey into preaching. These first few months, I’m focusing on the gospel lessons. Once I get the rhythm of sermon preparation and preaching into my DNA, I will allow myself to branch out into the other readings, I’m sure, but right now, there is much comfort in learning the ropes on tried-and-true texts. I will be eager to learn more about your planning process, as I grow into this preaching part of ministry. Thanks for your insights. to remind us, it isn’t a case of either lectionary or series. we can do both throughout a given year. and…. there’s also a third option, to simply pay attention to current events and to the lives of the flock, and preach sermons that are relevant to the needs and times of a given congregation; i.e., as free standing sermons that aren’t a part of a series or linked to the lectionary.